It was so long ago that the date eludes me but it had to be around 1990 that the whole teapot collection began. It really, truly started as a joke, a joke gone wild! We had a customer that worked for Bell Canada and he and his work buddies came in nearly every day. He enjoyed coming to the restaurant because we actually boil our tea water (rather than stealing from a coffee machine) and we use Tetley Tea, besides he loved the breakfast Quickies too and our wonderful friendly staff! Anyway, these cute little happy face teapots were on sale at Zellers, so I purchased one for him…it was a joke. Then customers started saying, “I want tea but I want the happy face teapot”. 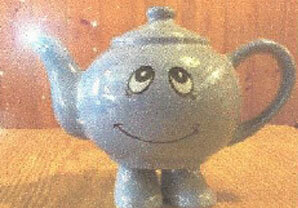 In a subsequent conversation with Mom (Rose) in Florida the story about the happy teapot was told. She came home in the Spring and brought more teapots, a woodstove, a piano, a pig…we actually served tea for a long time in these teapots. Unfortunately the dishwasher, was not kind to handpainted teapots, that is how they started being placed on the walls. As the years have gone by Mom and Dad have brought more and more teapots from their travels around the World. Customers have donated quite a few of them too. Soon, we had so many that the shadow boxes were built to display them and when that room ran out shelves were built. There are well over 400 teapots on display and dozens more Christmas teapots displayed during the holiday season – worth coming back to visit!